Our beautiful, spacious, modern 2 bedroom holiday home with sun terrace Avon Rose, occupies an elevated sunny plot in a quiet cul de sac on The Birches. 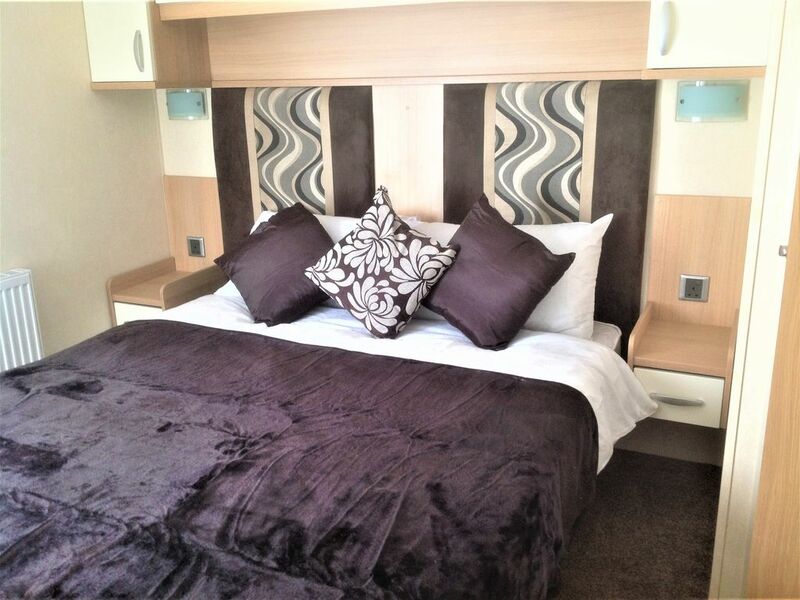 The caravan is luxurious and furnished to a high standard. It is double glazed and central heated. From the door it is a short walk to all amenities and downhill to the lovely sandy beach with cafe and water sports (charges apply on site). The kitchen has all the equipment you require; cooker with grill, fridge/freezer, microwave, toaster, kettle and cupboards together with a full range of cutlery, crockery and kitchen utensils. The lounge/diner is modern and spacious with free standing furniture and a sofa bed that sleeps 2 if required. There is a 32" flat screen TV/DVD, radio/CD player, iphone player, gas fire, dining table and chairs. The patio doors lead to the enclosed sun terrace with fold up table and garden chairs. The double bedroom has a king sized bed and an en-suite with toilet and basin. The master bedroom also has large fitted wardrobe which provides loads of space for your clothing. In the second bedroom there are two single beds and a wardrobe. If you prefer the beds can be pushed together to make a double. There is an additional toilet and shower room. Avon Rose caravans is dog friendly. There will be no extra charge for your dog, providing no damage is done and no extra cleaning is required. Please let us know when booking if you would like to bring your dog as conditions apply. Wi-Fi is not included in the price. Internet can be bought from Havens Reception. Fun Workz Passes are not included in the pirce. These can be bought from Havens Reception on or before arrival. There are four restaurants and takeaways as well as a SPAR convenience store, hire shop and launderette. WiFi is also available on site.